Pat meat dry and brown meat in batches in a soup pot. Set meat aside. Brown onion, ginger, scallions, garlic and chili. Add water, soy sauce, anise, cinnamon and meat with juices. Simmer, covered for 2 to 2 ½ hours. Transfer meat to cutting board. Discard bone and membrane and cut or shred into small pieces. Strain broth through a chinois, skim fat, add meat back in and season with salt. Meanwhile, heat unsalted water in another pot until boiling, remove from heat, add noodles, cover and soften 6-7 minutes. Drain and rinse with cold water. 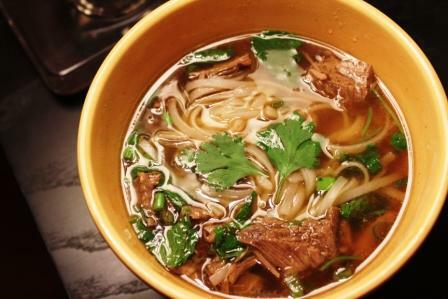 Place noodles in bowls, add scallion greens, cilantro and mint sprigs. Ladle in soup and flavor with lime. This entry was posted in Recipe and tagged Autumn, cooking, food, Life, Pho, random, Recipe, soup, thoughts by Julie "Phoren" Seyler. Bookmark the permalink. Ohh….on a cold, rainy day this would be ohhhh soooo making your insides warm nod nods.